Record heat across the globe continues to make headlines. Few serious policy analysts question the urgency for immediate action to curb carbon emission driven global warming. Meanwhile Florida regulators tilt the scales in favor of fossil fuel consuming utilities by obstructing Floridians’ access to solar power from off the grid. Incumbent fossil fuel providers argue that homeowners using solar must pay fees to cover their costs of using the grid. This line of argument ignores the fact that large capital outlays and other costs are avoided by eliminating much of the need for new power plants. * The state Senate’s proposed budget includes nearly $1.2 million to help the energy sector with drilling, analysis and marketing. * McCrory’s proposed budget includes $500,000 for drilling up to three test wells in Lee County, part of the state targeted for fracking. * A separate $550,000 initiative was approved last year to help the energy industry assess fracking prospects. Once again fossil fuel production is promoted by politicos and industry representatives as unleashing prosperity via free market forces. Yet in reality they ensure subsidies for fossil fuel marketers. As argued on this blog many times before renewable energy systems are far more deserving of subsidy due to their clear benefit to the shared prosperity of all via clean air and water. In essence, no-one really advocates that energy concerns don’t require taxpayer assistance at some level. The question is, which ones, and to what degree. Fossils have had their decades of taxpayer support and are highly profitable thanks in large part to such support. Its time to boost nascent renewable energy providers. For the sake of of today’s needs and those of future generations. Fund Balance has covered the damage done to the world’s ocean’s by discarded plastic at great length. Based on World Economic Forum projections more pieces of plastic will contaminate the world’s ocean than there are fish within it by 2050. Only about 5% of plastic is recycled. There is no system in place takes these plastic materials back. So after their use they pollute the ocean. Freshwater systems suffer as well. Plastic pollution interferes with every aspect of the world’s water ecosystem. Photo Credit. The US Environmental Protection Agency. All countries to one extent or another experience effects from the way plastic damages fish by filling up their stomachs causing them to starve or killing them by ensnaring them and causing serious injuries and even early death. Nations like the US and China, whose livelihood and or protein sources are highly dependent on the ocean worry. The World Economic Forum argues that innovation will be essential for the world’s oceans. Yet we all have reason to wonder if such innovation will be choked off before its can be launched. The shadow governance group American Legislative Exchange Council (ALEC) promotes model legislation to prevent local governments from banning plastic bags. Such moves run counter to innovation and seek to create and coddle ALECs corporate backers and their monopolies, particularly the Petroleum Marketers who provide substantial funding for ALEC. Petroleum is used to make plastic. The authors the World Economic Forum study argue that plastic manufacturing should be decoupled from fossil fuels. This will require doable and currently in process innovation. Such efforts will create many new economies and industries, as opposed to protecting one from the competition such innovation would bring. Apparently ALEC is not interested in the health and well being of future generations. If it did, it could use its abundant resources to help innovation of healthy ways to manufacture plastic materials. How can such groups claim to be focused on the future when they seek to continue to sell products that make the leave behind a badly damaged ocean for future generations? And what is the impact of such efforts to stifle common sense legislation to ban plastic bags on the drivers for innovation our way out of the plastic trap? Without healthy oceans the food supply for future generations and their very existence are at risk. And we know that even if all carbon being released today from fossil fuels were to halt, the climate would continue to warm for some time. Kind of like how just because you see an iceberg it doesn’t mean that you have time to steer the ship clear. Bank of America announced Wednesday it will reduce its financial exposure to coal companies, acknowledging the risk that future regulation and competition from natural gas pose on the industry. The bank announced its new coal policy at its annual meeting, saying it would cut back its lending to coal extraction companies and coal divisions of broader mining companies. “Our new policy reflects our decision to continue to reduce our credit exposure over time to the coal mining sector globally,” said Andrew Plepler, head of corporate social responsibility at Bank of America. The announcement comes amid a growing fossil fuel divestment movement, in which universities, churches and large asset owners are being pressured to abandon or curb their investments in high-carbon energy. Global bank HSBC said in a client research note in April that the recent drop in energy prices has put a spotlight on “stranded” fossil fuel assets, making them a risk to investors. Here we see CSR and Climate Change considerations making their way into one our nations systemically important and indispensable banks. More work is to be done, though, as BofA shareholders also rejected a resolution requiring the bank to report on its impact on climate change from financing fossil fuel projects. And while many claim that renewables are only competitive due to subsidies. Setting aside the fact that fossils also are heavily subsidized, solar along with other renewable energy technologies, have also seen a dramatic fall in costs, in the range of more than 60 percent over the last five years. This why nations like Britain that have scoffed at renewables now feature investors and developers actively bringing it online as an energy source. The lumbering big utilities that are so used to taking three months to study this and then six months to do that — what they don’t understand is that things are moving at the speed of business. Like with digital photography — this is inevitable. Two recent reports challenge the conventional wisdom that decarbonization via carbon taxes or other methods in concert with divestment from fossil fuel marketers means diminished prosperity. Both reports were widely covered and come from authoritative international groups. Both the New Climate Economy Project and a working paper from the International Monetary Fund (IMF) find that robust policy action reducing carbon emissions would have very limited negative effects on economic growth and shared prosperity. They also advance substantive arguments and analysis that such policies may indeed accelerate growth. In sum, there is no carbon bubble. If there were a carbon bubble, it would not be about to burst. If it would burst, the economic impact would be minimal. This might sound too good to be true, but it isn’t. These are serious, careful analyses…. On one side, there has been dramatic progress in renewable energy technology, with the costs of solar power, in particular, plunging, down by half just since 2010. Renewables have their limitations — basically, the sun doesn’t always shine, and the wind doesn’t always blow — but if you think that an economy getting a lot of its power from wind farms and solar panels is a hippie fantasy, you’re the one out of touch with reality. On the other side, it turns out that putting a price on carbon would have large “co-benefits” — positive effects over and above the reduction in climate risks — and that these benefits would come fairly quickly. The most important of these co-benefits, according to the IMF paper, would involve public health: burning coal causes many respiratory ailments, which drive up medical costs and reduce productivity. And we may be in later stages of divestiture than some opine. For example, Fund Balance has created an ETF on the Motif Platform that tracks Coal Stock prices. It was initiated after Stanford University’s signal move to divest from coal stocks. This ETF is down 32% since inception in May 2014 vs. 5.9% return for the S&P 500 and down 77% over the past five years vs. a 109% return for the S&P. Coal stocks have fallen even further since major Universities began divesting. What of the argument that China and India will continue to rapidly increase their respective carbon emissions even as US and EU emissions fall? We can see now that there are many health benefits and hence productivity gains from cleaner air and water. Factor in the inevitable pressure such efforts will put on these two nations to curb emissions as well as their budding sustainability movements (not to mention pollution so bad that major cities must be shuttered and entire rivers cleaned ever more frequently), and such arguments suddenly reveal their superficiality. There are many reasons to celebrate Labor in the U.S. as well as to consider what its role in the 21st Century can be. The American Society of Civil Engineers, when they graded our nation’s infrastructure, assigned a startling D+. Firstly, our nation’s infrastructure has in most areas been allowed to decline. Secondly, large public works projects, the W.P.A., NASA, The Internet, and the Interstate Highway system result from the type of investment and resources only the U.S. Government can bring to bear. Wal Mart and Amazon disproportionately use the highway around their distribution systems and drive great financial benefit, Google and Apple have built entire new markets with mobile app GPS driven ecosystems thanks to NASA and its innovations in satellite technology, and the WPA built up everything from Libraries to the Hoover Dam. So even while well established fossil fuel marketers continue to enjoy subsidies, lets apply some to Solar. (The same can be said for large agri-businesses and our water treatment and delivery systems which I will address in a later post). Thirdly, all these industries need large volumes of energy from electrical power. With Solar now on parity with coal in many areas, now seems the opportune time for a nationwide solar public works initiative. Solar has much to offer, from energy independence, low carbon emissions and thus greenhouse gas/pollution reductions, and resiliency. This resilience proved itself in the Sandy storm and flooding, as the solar stations at work there stayed online even while diesel ones went down due to flooding and the frequent inability to get diesel to the necessary places. 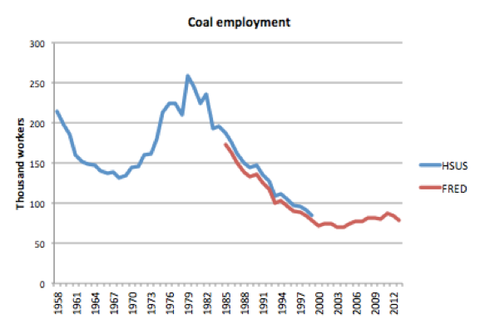 Its important to note that claims that such programs will hurt coal miners are false and misleading; the coal mining industry cut its employment numbers by more than 2/3’s over the last thirty years via the automation of strip mining. Here at the midpoint of 2014, solar power technology continues its advance while its marketplace momentum builds. Economic policy and commercial efforts designed to induce commercial innovation must keep apace. And there are pockets of progress in the political economics of deploying solar. Take for example this post from Clean Technica: “Solar Energy’s Quiet Invasion Into Professional Sports“. Or consider the Regional Greenhouse Gas Initiative (RGGI), a market-based regulatory program in the United States that reduces greenhouse gas emissions. Despite not having a generally sunny climate, Germany has been pushing solar energy, but not from the huge solar farms as seen in other countries. Other nations, like the United Kingdom, report the same. The German government is on track to reduce greenhouse emissions from electric power generation from coal fired power plants while at the same time retiring its fleet of nuclear power plants (scheduled for closure by 2022). The FRG aims for an energy mix of solar, wind and biomass; though solar has become the national leader according to most reports. The move to solar has not been without its problems, of course. The government plans to lower or remove subsidies as soon as possible, and the demand for batteries to store all that home-grown electricity is outstripping supply causing a rise in prices. Also, it’s not clear what sort of role utilities will play going forward. Currently, many homeowners are reporting surplus energy production on sunny days which they sell to electric companies, which now find themselves having to store it for use during cloudy stretches. There’s another problem though it’s not as obvious: the German government noted recently that almost seven million households in the country are living in energy poverty (defined as having to spend more than 10 percent of income on energy bills). The national energy program, Energiewende, has resulted in some transfer of wealth. Economists note that even with subsidies, it’s generally the wealthy and sometimes the middle class who can afford to put solar panels on top of their houses. The poor continue to live off the grid paying taxes that provide the funds for the subsidies. There’s also some evidence that the country’s energy program is pushing energy costs higher overall, resulting in more electricity being produced by cheaper fossil fuels. Light Emitting Diode (LED) demand continued in the first Quarter of 2014. LED fab utilisation rates have improved to high levels and LED adoption is happening faster than many had expected. LED customers are also reporting increased market demand for LED backlighting products. Many leading customers are placing orders for capacity expansions. Across the industry Q1 was a significant improvement over the last quarter of 2013 with higher revenues, better margins, and falling operating costs. Our work with privately held early stage start-up firms echoes what we hear from publicly trading firms and their coverage by leading analysts. We believe that higher LED consumer usage combined with new and lower cost products, cost reductions, and higher factory utilization will help increase LED usage in residential and commercial real estate. Unfortunately, stock prices in the sector generally have increased much more rapidly than earnings so investors may want to wait for a dip before entering the public market for LED stocks. A look at Phillips N.V. is instructive. The Dutch conglomerate has reported flat earnings and generally lackluster revenue growth in the Q1 of 2014 with one exception. At Lighting, while sales were flat on a comparable basis, LED-based sales climbed 37 percent, and now represent 33 percent of total Lighting sales for the Dutch conglomerate. Notably, then, Phillips had a flat quarter while its LED unit continued to outperform rising 37% in the first Quarter of 2014. Solar power stocks have shone over the past year. After four years of decline the industry experienced vigorous growth in 2013. The first growth spurt in the early 2010’s was propelled in large part by European incentives which induced component and material shortage in 2007-2008. This pushed solar stocks to record highs and to a subsequent bust the next year. The main driver for the market-wide collapse was significant state-level investments in China that led to a large surplus from output from some 500 Chinese companies that produce modules, wafers, and cells. The Chinese investments fostered an overcapacity in production, which hit the the majority of manufacturers in the space. Most non-Chinese manufacturers were then quickly eliminated from the industry. Weaker Chinese companies also fell to price pressures while other participants wanted out of the business. All the while, start-up manufacturers flooded the market with an ever lower priced inventory predictably spurring the aforementioned bust.